Divorce is no longer the last chapter in your life. After divorce move on with life and find love again. Though it can be frustrating, an emotional roller coaster, in the first few weeks, but you need to pull yourself together. Gathering the support of extended family and friends can be your first step to recover from a failed relationship. If children are concerned, they need to be reassured about the love despite the change in family structure. 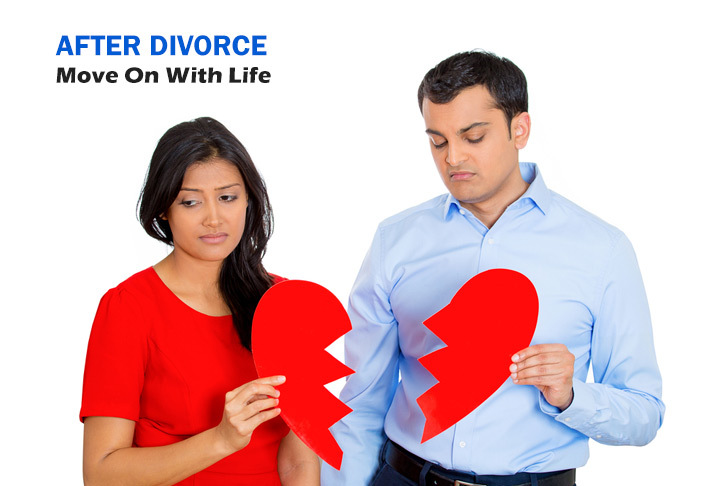 Divorce can come about as a sudden decision, or a thought over mutual decision, but the fact is irrespective of who took the step to separate, the faults lie deeper. However, you need to realize that it is just another relationship that ended and love can blossom again. Divorce is not a stigma any longer. You are not judged just because you got divorced. You learn from it and ensure that the mistakes are not repeated when you get into a new relationship or marry again. With plenty of dating websites and matrimonial portals catering to second marriages, it is an accepted norm. Don’t close your heart or lose confidence in your ability to sustain a long-term relationship successfully. Don’t bottle up. It is best to discuss and vent out your ideas and feelings so that the negativity can flow away. Resentment and negativity just builds anger which in turn can lead to stress and ill-health. Learn from your experience and don’t make the same mistakes again. You don’t have to lose hope and feel dejected. A failed relationship is just a chapter in your life not the whole book. You might still harbor feelings for your spouse despite the differences, but stay positive and move on. Love might be just around the bend. Stay confident about your abilities and be involved with the children and work. This will keep your mind off the emotional turmoil.